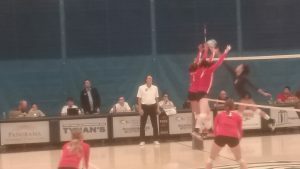 DENVER, Auraria Campus – The MSU Denver volleyball team played their Rocky Mountain Athletic Conference game Tuesday Nov. 16, at the Auraria Event Center. The Roadrunners hosted a quarterfinal tournament against the CSU-Pueblo Thunderwolves. 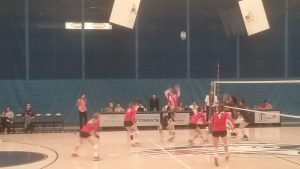 The Thunderwolves did not finish their regular season with a winning record, posting a season 12-15 overall and a 10-9 in Rocky Mountain Athletic Conference play. The home team Roadrunners are tough customers to all challenges. Metro State entered the contest on an impressive 19-game-winning streak. The Roadrunners ended their regular season 24-3 and 18-0 in the RMAC. 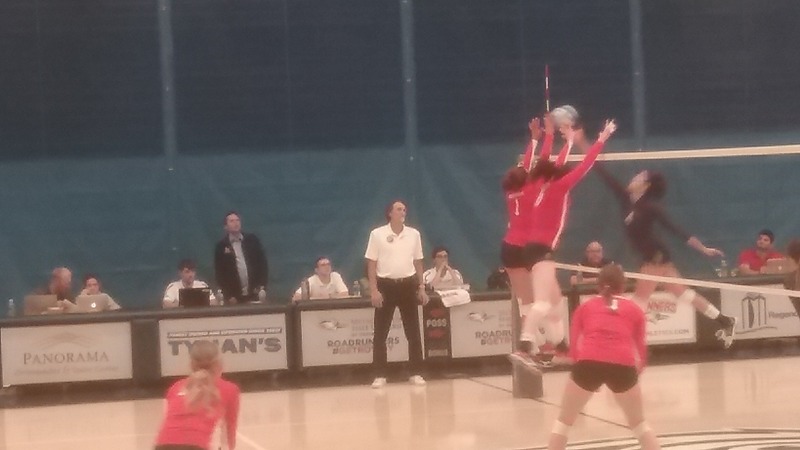 Metro State defeated CSU-Pueblo in both regular season meetings – winning both matches 3-0. The third time was not the charm for the Thunderwolves. The women of Metro jumped out to a 4-0 lead and kept their foot on the accelerator. The Roadrunners snatched the first set 25-20. The Roadrunners swept the match, winning the next two sets 25-23 and 25-22. Senior outside hitter Michaela Smith flexed her muscle all night – posting 16 kills, 3 blocks and 2 aces. Smith received a first team all RMAC honors this season. Her teammates also delivered the goods. Sophomore blocker Stephanie Laraway stalked the net providing 11 kills and 5 blocks. RMAC coaches voted Junior right side Ryan Hoerdemann to the RMAC all conference teams as well. Hoerdemann posted 8 kills and 2 blocks. The newly crowned RMAC setter and Player of the Year Brandi Torr, positioned her teammates to torch the nets, leading the Roadrunners with 40 assists. Following the contest, MSU Denver Coach Jenny Glenn was upbeat and vibrant about her team’s performance. Glenn disclosed the tactical strategies she wanted her team to execute. “We talked about winning the serve and pass game. We had to battle in the passing lanes,” Glenn added. “We did serve tough to limit their fire power, we defended them pretty well.” The Roadrunners heard their coach’s message loud and clear in route to a victory. The Roadrunner’s road to a championship continues on Friday, Nov. 18. MSU Denver will host Regis the #4 seeded in the RMAC semifinal tournament. The first serve is scheduled for 7 p.m.
Coach Glenn added the team will practice next, and then distribute turkeys to the less fortunate the week of Thanksgiving. Congratulations are in store for Glenn. She has received the most votes from her conference-coaching peers, and is the 2016 RMAC Coach of the Year. Earl Grant is a Denver-area sports journalist.